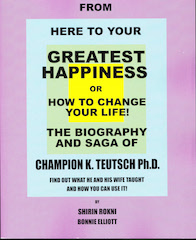 The Biography and Saga of Champion K. Teutsch Ph.D. This biography is not just the life story of Champion Teutsch. In these pages we will explain many of the concepts he and his wife, Joel, wanted us to understand. Please contact us to purchase your copy.